Cholesterol is a fat-like substance that your liver and other body cells produce; however, the animals that humans use as food sources produce it as well, which means that you also obtain it from some of the foods you eat. You need a certain amount of cholesterol to produce bile acids that help digest your food, to build healthy cells and to synthesize hormones and vitamin D. Your body produces about 75 percent of its own cholesterol, but the remaining 25 percent comes from your diet. When your cholesterol level is too high, it can lead to coronary artery disease, heart failure, heart attack or stroke. You should keep your daily cholesterol intake below 200 milligrams daily, according to the National Heart, Lung and Blood Institute. The cholesterol in your diet comes from animal-based foods including meat, seafood, poultry and dairy products. 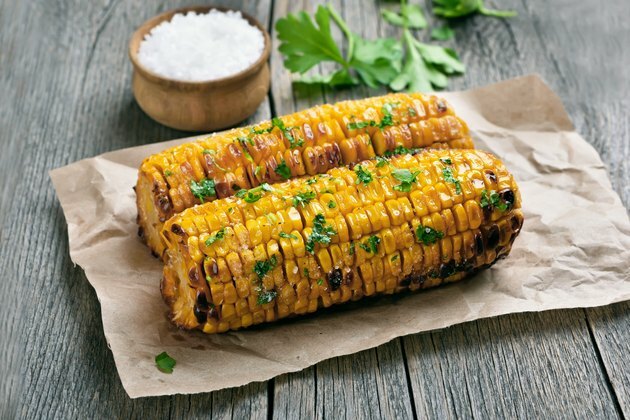 Corn on the cob is cholesterol free, as are fresh, frozen and canned varieties of corn kernels, according to the U.S. Department of Agriculture. Corn products remain free of cholesterol unless they're combined with meat, poultry, seafood, dairy or other cholesterol-containing animal foods. Cold cereals such as corn flakes and cooked corn cereals like yellow or white grits don't contain any cholesterol. Although it's loaded with fat, corn oil is cholesterol free -- and corn syrup is packed with sugar but has no cholesterol. Canned corn is a cholesterol-free vegetable, even when it's manufactured as creamed corn. Corn tortillas, raw cornmeal and corn pasta are also cholesterol-free foods. When animal products are used to improve the flavor or texture of a food, they often add cholesterol to the food product. Commercial cornbread stuffing mix contains 5 milligrams of cholesterol in an 8.5-ounce bag, while a medium commercially baked corn muffin delivers about 29 milligrams and cheese puffs made with corn have 1 milligram of cholesterol in a 3.5-ounce serving. A single corn dog packs in 79 grams of cholesterol, which represents 40 percent of your recommended daily limit, based on a 2,000-calorie diet. Although grits and corn cereals are cholesterol-free, certain recipes and condiments can introduce unwanted cholesterol. If you pour half a cup of whole milk over your cereal, you add 12 milligrams of cholesterol. Choosing nonfat milk reduces the cholesterol count to 2.5 milligrams. When you fry a cholesterol-free corn tortilla in 2 tablespoons of lard, it change brings the cholesterol content to 24 milligrams. If you steam your tortilla or microwave it, it remains cholesterol-free; however, slathering 2 tablespoons of butter onto an ear of corn adds 62 milligrams of cholesterol, while the same amount of fat-free vegetable oil spread from a tub delivers zero grams. Is Eating Liver Good for Cholesterol Levels?